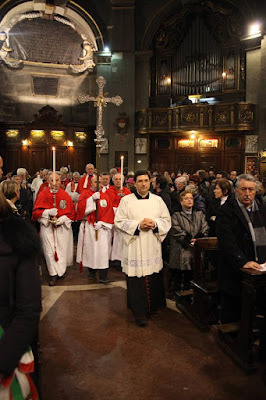 In the year 1576, Milan was devastated by a particularly severe outbreak of the plague; several of the episodes later noted in the cause of St Charles Borromeo’s canonization relate to his pastoral care of the sick and dying in this period. As part of a vow made to end the disaster, the city government built a church dedicated to one of the most popular Saints to invoke in times of plague, St Sebastian, whose mother, according to St Ambrose, was a native of Milan. 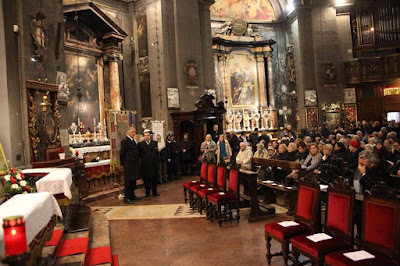 The cornerstone was laid in 1577, and the building completed in 1616; it is still to this day owned and administered by the city of Milan, and known in Italian as the “Tempio Civico” (civic temple) of St Sebastian. 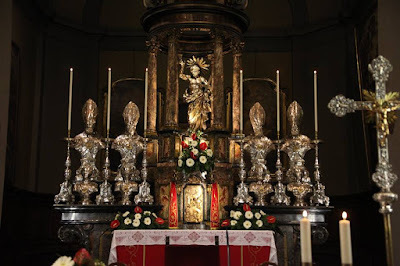 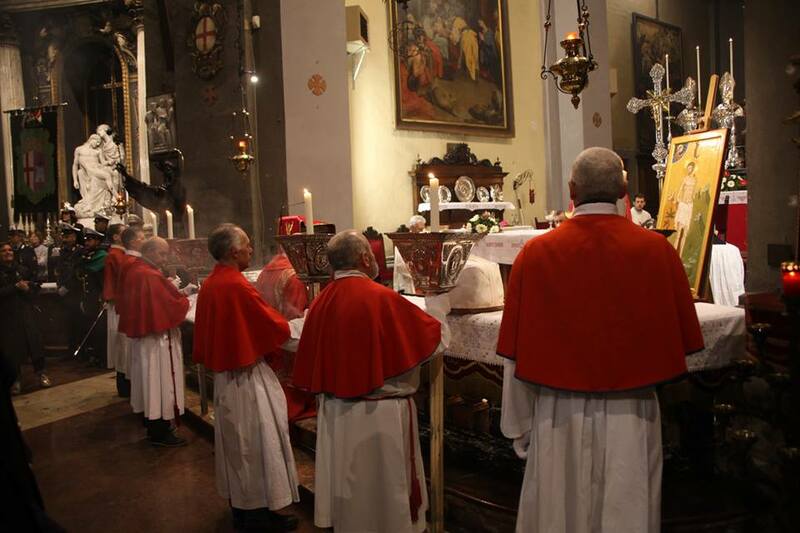 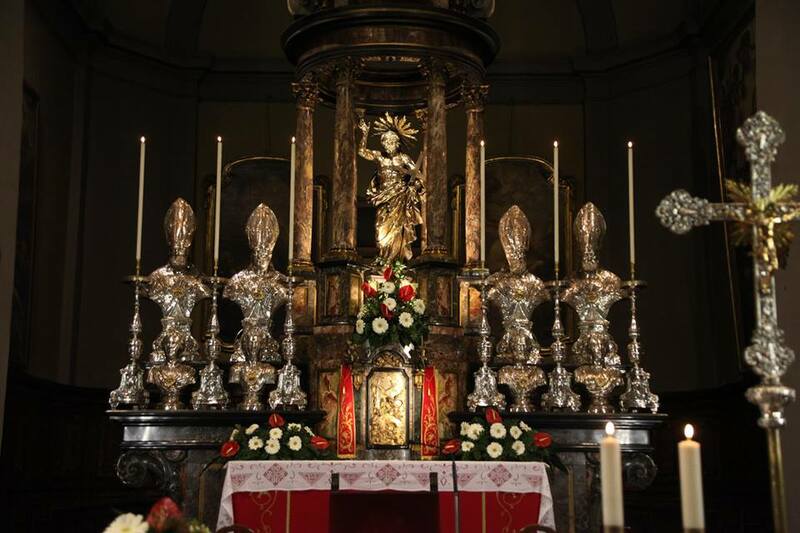 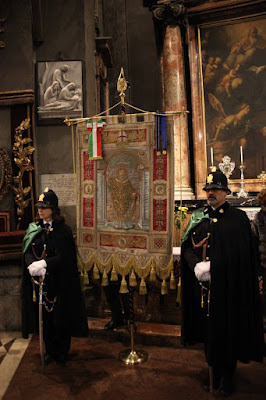 Each year on the patronal feast day, during the principal Mass, representatives of the municipality offer a certain number of candles, and enough oil to fill a votive lamp, as part of the fulfillment of the vow made in perpetuum, still being honored after almost four and a half centuries! The following pictures of this year’s Mass come to us from our Ambrosian correspondent, Nicola de’ Grandi. 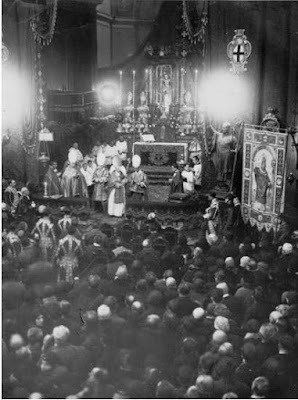 We start, however, with two pictures (also provided by Nicola) of the same event from the days of the great Blessed Ildefonse Schuster. 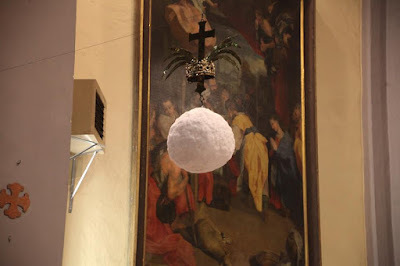 In the first of these, we see the lighting of the “faro”, a spherical metal frame covered in a thin layer of cotton, which is lit on fire at the beginning of the Mass in the Ambrosian Rite; this is done only on the feasts of Martyrs, and only in their own churches. Below, we also have a video of the lighting of the faro this year, very kindy provided by Mr Luca Geronutti, and edited for our use by Mr Marc Williams, with our thanks! This appears to have been taken during the sermon; note the mitred canons! 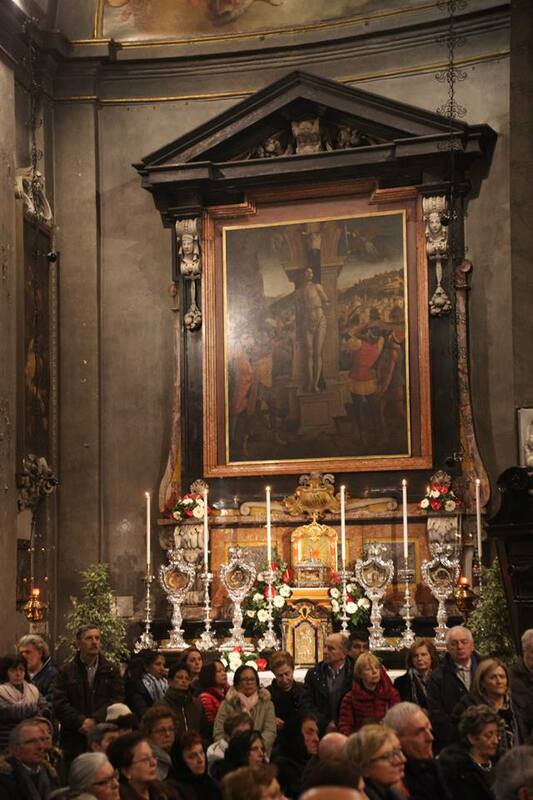 From this year’s ceremony: the altar decorated for the feast, with the faro suspended in front of it. 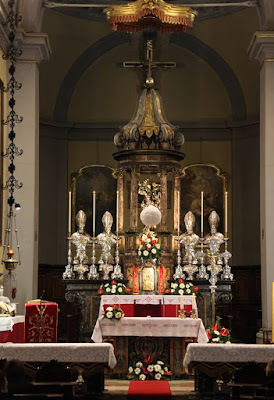 A better view of the faro; note the palm branch and crown of martyrdom which decorate the Cross. 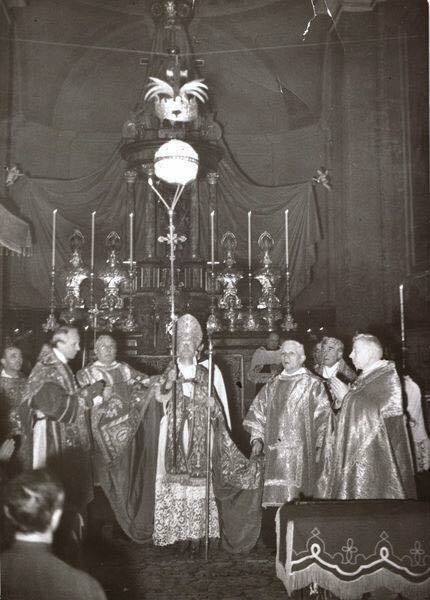 The lighting of the faro. 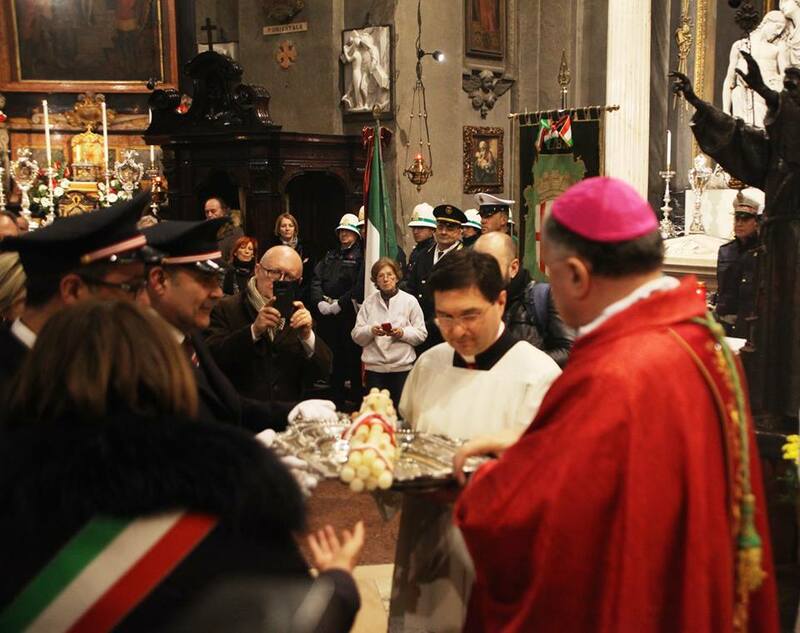 The candles are presented to the celebrant of the Mass, Mons. Erminio De Scalzi, Auxiliary Bishop of Milan and Abbot Emeritus of the Basilica of St Ambrose. 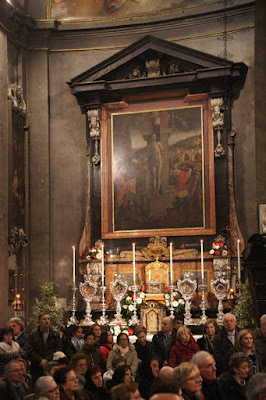 The presentation of the oil for the votive lamp. Members of the Confraternity of the Blessed Sacrament holding some very nice torches during the Canon of the Mass. 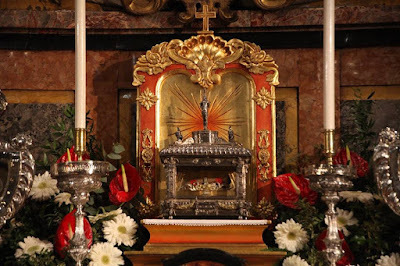 A major relic of St Sebastian on one of the side-altars. 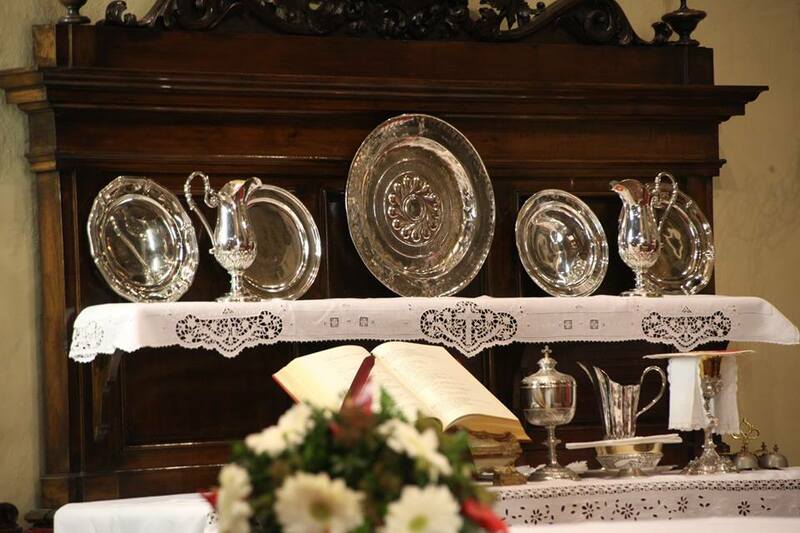 In accordance with an old custom, the church’s plates are displayed on the patronal feast day as well. 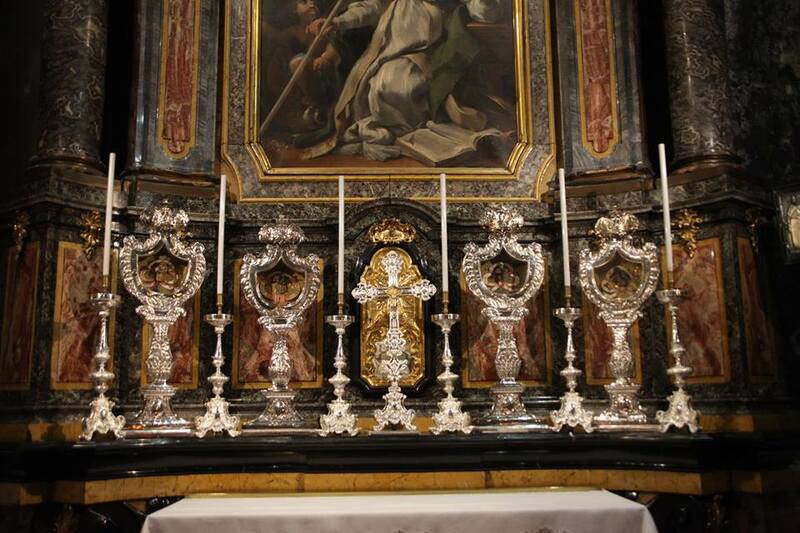 Relics on one of the other side altars. A smaller version of the gonfalone of St Ambrose.